Belkin's Wemo Mini smart plug has gained HomeKit support through a software update, as reported today by CNET. This means that owners of Wemo Mini plugs can simply open the Wemo iOS app, update the device's software, and immediately gain the ability to add the plug into the Home app, add it into existing scenes, and use Siri to control it without the need for a Wemo Bridge. Apple first announced that it would update its HomeKit specification during WWDC 2017, so that compatible smart products no longer have to include a hardware authentication chip. For products like the Wemo Mini, this means that authentication goes through software instead and greatly streamlines how developers integrate with HomeKit. Although announced at last year's WWDC, the change eventually launched in iOS 11.3 in March 2018, and the Wemo Mini is now the first HomeKit product to connect to Apple's platform using the software protocol, a Wemo spokesperson said. The team at Wemo also tells us that the Mini is the first HomeKit device to connect with the platform using Apple's software protocol instead of the MFi chipset that was initially required at HomeKit's launch. "No other non-chipped product has the ability to do the HomeKit authentication via a software update as of yet," a company spokesperson tells CNET. In that sense, the ability to connect with HomeKit via software instead of hardware represents a fairly significant step forward for the platform, and one that could make it easier for other existing devices to jump on board. That'd be a win for Apple, which has thus far struggled to keep up with Amazon and Google in terms of the quantity of devices that work with its smart home platform. Apple did not immediately return a request for comment. The $34.99 Wemo Mini is a smart plug that lets users add smart home control to normal products, like a bedside fan, lamp, coffee pot, and more. Smart plugs are a popular HomeKit accessory given their compatibility with a wide range of devices and cheap price tag. Other companies that make HomeKit smart plugs include iHome, iDevices, Koogeek, and Elgato. Belkin initially introduced HomeKit support for its Wemo products with the Wemo Bridge, and although the Wemo Mini will no longer require a Wemo Bridge for HomeKit compatibility, other Wemo products will still need the Bridge to connect to Apple's platform. The team is working on updating other products similar to Wemo Mini, and says the Wemo Dimmer accessory is next on the roadmap for a HomeKit software update later this year. For the Wemo Mini, users will see the HomeKit software update beginning today, and a rollout to all customers is expected to be finished as soon as next week. These are the ones all over my home and I always hoped they’d be upgraded. It’s nice when a tech gamble pays off. These switches seem a bit pricy compared to the competition. Any good reason for that? For one, what other manufacturer would have upgraded their software rather than charge you for a whole new plug to work with HomeKit? 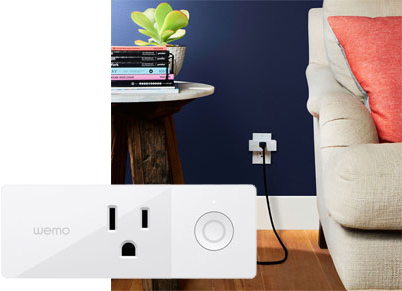 These WeMo mini plugs rarely work and set-up is such a hair-pulling struggle because of the buggy app. Every time I press the "Update" button in the WeMo app to update the firmware, it just takes me to the previous page; it's almost like the button doesn't do anything. The plug is surprised to hear this news. "Download the app release and keep an eye out for an important firmware update..."
So I'm guessing that's coming at some point in the future. But I do agree, their app isn't the best. Read post #53 above for the explanation from the Vendor. Great news, nice to see software auth for HomeKit being implemented. Firmware just showed up after force-quitting and restarting the app. Updated, had to register in Home app and remove from Homebridge but all is good now! Hahahahahahaha. This made my day.